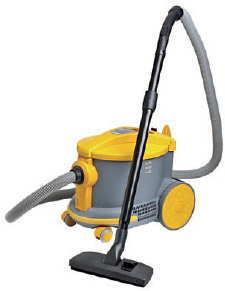 The Ghibli AS 6 Dry Vacuum Cleaner / Hoover is a powerful, versatile, and silent dry vacuum cleaner. It is equipped with a large capacity container and is suitable for those places requiring minimum noise levels with great performances. Ideal for the home, contract cleaners, offices, hotels, shops, hospitals, laboratories and much more. The Ghibli AS 6 has a four way filtration system with a blocked filter warning light. It has accessory storage points & a power brush outlet socket. The two large rear wheels & front swivels castors make it an extremely manoeuvrable machine.